We rarely see Apple devices discounted as the firm's hardware holds its value very well, so there's good news for bargain hunters as the Cupertino, California based company has confirmed it will be offering Black Friday deals. 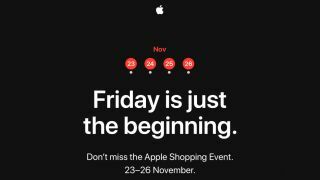 Apple will run its Black Friday sale (which it's calling its 'Shopping Event') between November 23 (Black Friday) and November 26 (Cyber Monday), giving you four days of savings in total. It's currently not clear what will be on offer, but the hope is we'll see discounts across the iPhone, iPad and Mac ranges. We'll be keeping a close eye on Apple's deals and will highlight the best ones so you can be sure to buy with confidence.